"A touching, playful story about family, forgetfulness and friendship." A touching, playful story about family, forgetfulness and friendship. Every Saturday Perry and her father visit her gran, Honora Lee, at the Santa Lucia retirement home. Honora is sharp, outspoken and sull of surprises. Perry adores her, but Gran's memory is failing. As Perry compiles an ABC of life at Santat Lucia for a school project, it seems to her that Gran is losing words just as quickly as she is collecting them. Together the pair provide a unique lens on life, language and growing old. Beautifully illustrated throughout, THE ACB is an uplifting, moving and poetic story which celebrates being different and will delight readers of all ages. 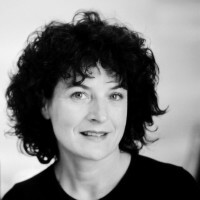 Kate De Goldi grew up in Christchurch, New Zealand. When she wasn't reading, Kate could be found writing plays to put on with her sisters, school friends or 42 cousins. She is now known for her novels, short fiction and picture books, and has won many prestigious awards for her work. THE 10PM QUESTION won the New Zealand Post Book of the Year in 2009 and in that same year, was also selected as a White Ravens Outstanding New International Book for Children and Young Adults. Kate currently lives in Wellington, New Zealand, where she writes her books in a walk-in-wardrobe.